You are here: Home » Countries & Places » Belgium » Restaurant Savarin at Ostend’s Venetiaanse Gaanderijen; summer bliss! Restaurant Savarin at Ostend’s Venetiaanse Gaanderijen; summer bliss! It’s the stuff that holiday dreams are made of: you’re whiling away a blissful afternoon on a sun soaked promenade, and you fetch up at a rather elegant beach front café bar. As the gently cooling sun tracks the heavens to its westerly repose, you sip a cool beer, or refreshing glass of wine, and imagine you’re someone else for a while, living a life other than your own. Such places are few and far between, affordable ones even less so. 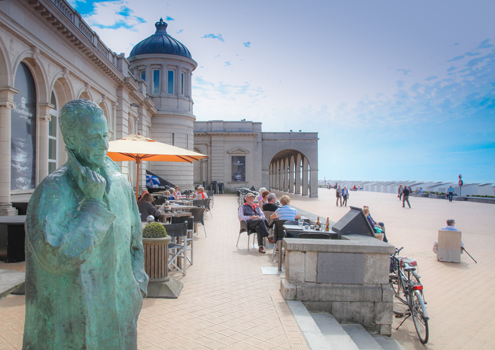 Unless, id est, you are lucky enough to discover Restaurant Savarin at the Venetiaanse Gaanderijen, nestling in all its Victorian splendour, on Ostend’s prestigious promenade. With seafood aplenty on the menu, including oysters, crab, lobster and bouillabaisse as well as the usual fare, you can also choose steak and chips or a refreshing salad, plus a commendable range of delicacies for dessert. Hard or soft, warm or cold, the choice of beverages is equally ample, and the uniformed waiter service completes the picture. The fact that all this comes in at prices which are probably half what you would expect for such a venue, in our opinion, makes this already splendid establishment just perfect. Leave Ostend without trying it at your peril!